Left Alive was previously given a February 2019 release date in Japan, and now we know that the Western launch will occur soon after. Square Enix has officially announced that Left Alive will be releasing on March 5, 2019 for the PlayStation 4 and PC. In addition, some special additions for Left Alive were announced. The Day One Edition can be preordered on the PlayStation Store now. Square-Enix will also be selling a “Mech Edition” of Left Alive that will only be available on the Square Enix e-Store. 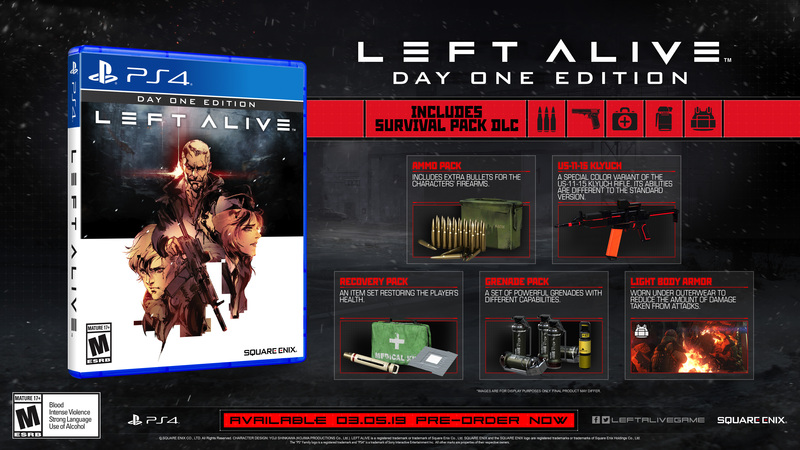 It will include the full Day One Edition of Left Alive, as well as a bunch of other goodies. It comes with a figurine of the mech Volk, which has interchangeable features, an exclusive art book featuring concept art, a steelbook case, and a collector’s box. The Mech Edition is billed as “extremely limited,” so you may want to preorder it now if you want your hands on it. Left Alive releases on March 5, 2019 for the PlayStation 4 and PC.